Recently I was riding when someone cut me off to park on the wrong side of the road and facing the wrong direction. Of course this upset me, but as I promised myself and my son, I would maintain control and self composer. Therefore, I had a split second, inner dialogue, about what a dangerous and ridiculous move this guy did. The driver must have seen my facial expression and as I rode by slowly, with a lifted eyebrow and peering into his window, he began to wave his hands in the air and mimic me like a little child, with his tongue out! At this moment I forgot all about being upset with his thoughtless driving and instead smiled at how ridiculous this guy looked. Moreover, I quickly realized how car drivers are like turtles in a turtle shell. How they feel protected inside their shell of a car but once they are out into the open and unarmed, they are completely different. I tried to imagine if this guy would act the same if we were in the grocery store. Lets say he grabbed the last avocado and I expressed facial dissatisfaction. Would he then mimic me and wave his arms around? 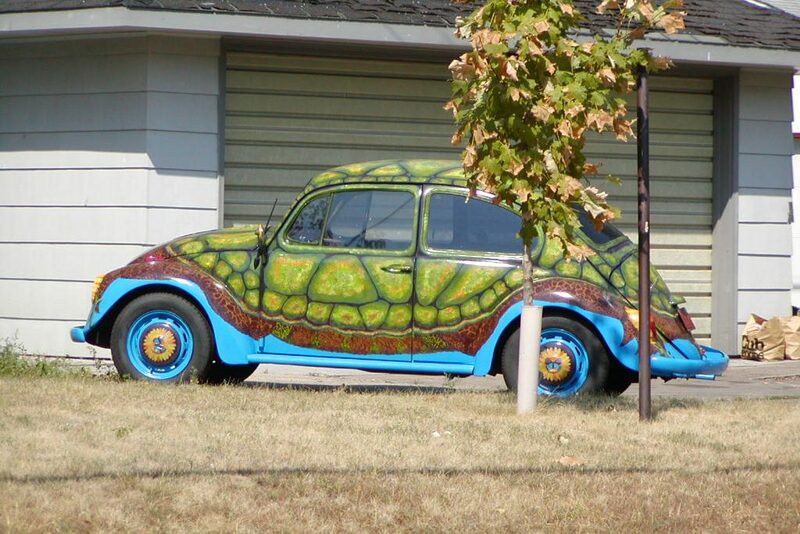 Besides being turtles in a shell for a car as protection, I also compare motorists to turtles. For example, when they are all lined up in a row and waiting for the light to turn green, especially during rush hour. These same people also believe that having a car will make them faster.